Hurricanes. Tornadoes. Riots. Terrorists. Gangs. Lone criminals. These are perils we are sure to face -- not just maybe. It's not paranoia to buy a gun. It's survival. 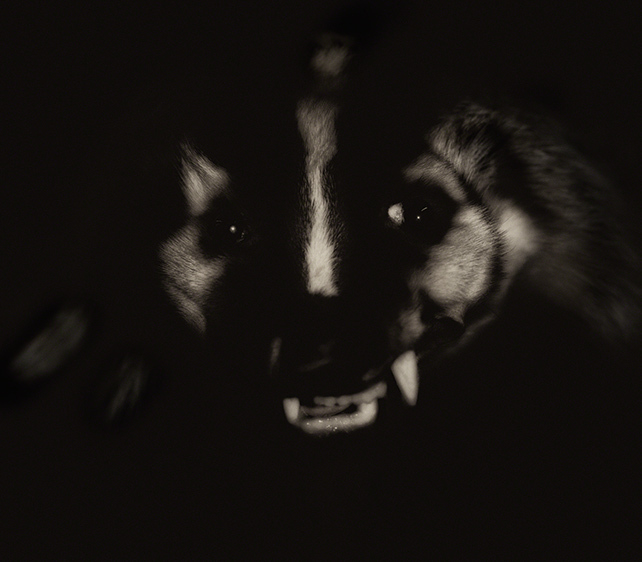 Lori Pond: Badger (2015). All images courtesy of the Artist and Gallery 825. 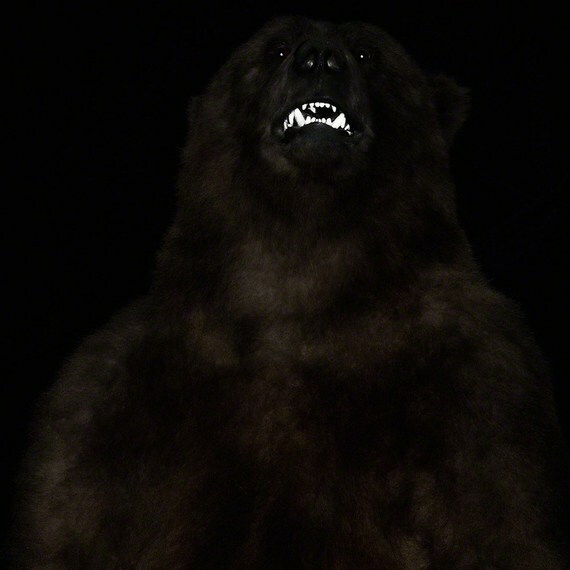 Photographer Lori Pond is curious about fear. Not a general sense of unease for foreboding; not mundane anxiety; not esoteric crises or arbitrary phobias -- but real, urgent, existential fear. The immediate kind that triggers the so-called Fight or Flight response in an otherwise calm mind and body, coursing adrenaline, clenching muscles, racing heart. The kind that kicks in when, say, you are suddenly confronted by a ferocious animal capable of killing you. 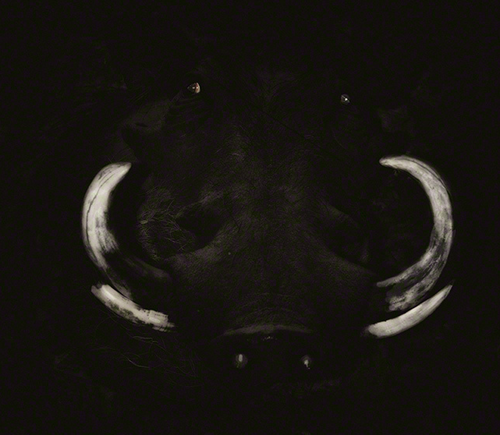 In MENACE, Pond has created a series of mysterious, evocative images depicting taxidermied predator animals in extreme, more or less life-size close-ups whose poses and compositions echo conventions of portraiture, yet subvert specific narrative in favor of a more Jungian assessment of audience response. 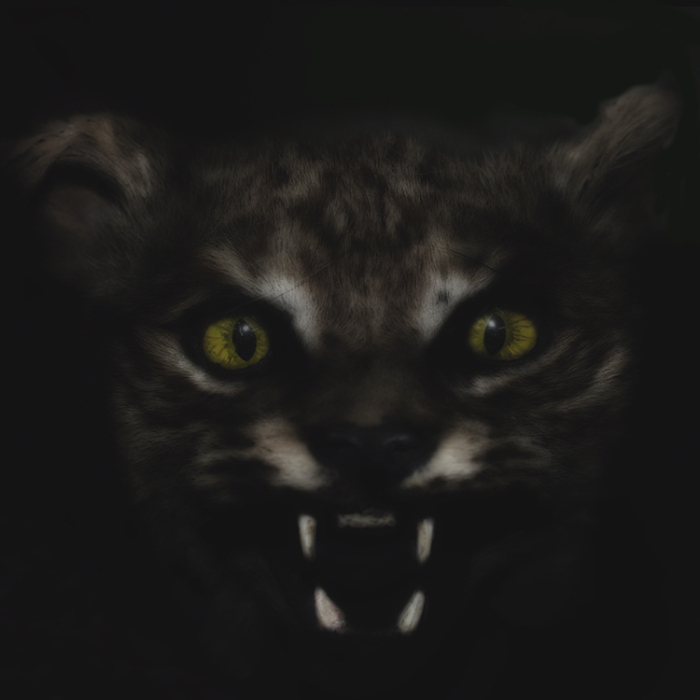 Her treatment of the black and white images results in an effect of the creatures emerging from a solid darkness; their surroundings are an inky, velvety midnight that almost entirely obscures their mottled figures save the bright white highlights of fang, claw, tufted fur and sparkling eye that are the first to emerge from the swallowing shadows. A psychological tone of conceptual distress is heightened by Vicki Ray's avant-garde piano soundtrack of cinematic nerve-piquing dissonance. The instinct to run from the bared fangs of a hungry wolf, mother bear, or a baboon with murder in its heart is, to be sure, a helpful survival skill, and one that evolution de facto selected for. But as everyone knows, physical evolution lags far behind societal change. So our brains retain this atavistic reflex, but, wonders Pond -- what is it that scares us now? 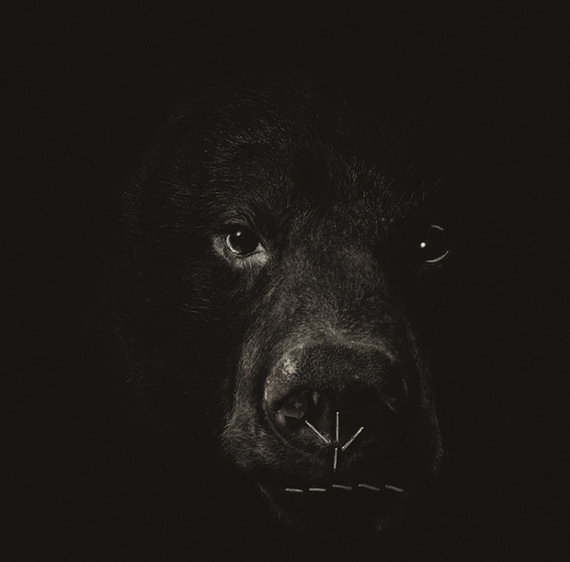 Will these images of frightful animalistic threats be enough to overcome the mind's rational awareness of its safety in a modern art gallery setting, even for a split second? And if not, then what is it that scares us now? We have new fears that didn't exist then, like being shot or kidnapped. We might not be afraid of being eaten, but we are still afraid of being killed -- by gangs, by terrorists, by sharks. Especially thanks to the irrational fears stirred up by the government, the media, the NRA. But then again, does some part of us not seek out the approximate experience of existential fear? We parachute, we watch horror movies, play violent video games, go on safari, pursue adventure sports, war reenactments, bungee jumps, roller coasters... Is this to kind of scratch an itch? Is it a neurological solution in search of a problem? War is real, some jobs are dangerous, earthquakes strike cities and really scary stuff happens at random with no warning, sometimes to people we know. Maybe we should be more afraid. Probably not of bears though. If we are to be afraid of something, perhaps it should be the dark. The kind of thick, enfolding darkness which in Pond's photographs both swallows and brings forth the most terrifying thing of all -- the unknown. MENACE opens Saturday, October 17 (6-9pm) and is on view through November 20 at LAAA/Gallery 825 in West Hollywood.